Bruce Tate is a kayaker, mountain biker, father, author, and Java programmer in Austin, Texas. 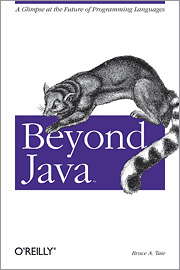 His five books include Better, Faster, Lighter Java and the bestselling Bitter Java (Manning). His 17 years of experience include stints at IBM, two failed startups, and his own independent consulting practice called J2Life, LLC.